I am aware that a lot of you have been attacked by ants on various occasions, so let me ask you a simple question- did the ant sting you or did it bite you? I too was when I was attacked many years ago by a Procession Ant | Leptogenys processionalis (Jerdon, 1851) (Fig. 1) and it took me some years to realize that I was "stung", but does it mean that I was not bitten? Turns out that I was bitten too!!! So, what do ants do? Sting, bite or both? Do all ants sting? Is the ant sting venomous? Can a human die if stung by an ant? Which ant's sting/ bite is most painful? These were some of the questions asked by a bunch of 9th standard kids, while I was in Chennai. It was while answering to them, that I thought that I need to make a post on this, since a lot of other friends too have asked me the same questions in the past, last being Umar Khan from Delhi. To try to find answers to these questions, we must travel back in time to the mid- Cretaceous period between 110 and 130 million years ago, when the first ants evolved from their ancestors the wasps according to various myrmecologists (people who study ants) like Brown, Wilson and Malyshev. Many of these primitive ants have now evolved into species that we see today and most of them exist only as fossils, but out in Australia is one such living primitive ant genera Amblyopone belonging to the subfamily Ponerinae on which myrmecologist Charles Kugler had done extensive studies to determine the nature of its sting, stinging apparatus and mechanism way back in 1978 (Fig. 2). These primitive ants use their sting for subduing live prey and for personal and colony defense. When an ant from the subfamily Ponerinae stings, it grabs hold of a part of its victim’s body with its mandibles (teeth), arches its body to give it the necessary support/momentum and drives the sting downwards (Fig. 3). This is what precisely happened in my case since the procession ant belongs to the subfamily Ponerinae. That solves the mystery of how I was bitten and stung simultaneously. Most ants which have such functional sting have similar mechanism. The interesting thing though is that several of the ant subfamilies have deviated from what is described above. Ants from the subfamily Formicinae and Dolichoderinae, have lost major portion of their sting apparatus. In short, there are many ants out there which can't sting. If most of the modern day ants have lost one of their most potent weapon, the “sting”, how is it that they still are effective hunters and highly successful in fending for themselves? The answer to that lies in the way ants have evolved. Primitive ants that first evolved were solely dependent on live prey and were active hunters. With evolution of the flowering plants and higher selection pressure, subfamilies like the Myrmicinae evolved to digest vegetable matter in addition to scavenged arthropods and sometimes live prey. The immediate effects of this evolutionary change would have increased the adaptability of these subfamilies to changes in the environment by letting them exploit secondary food sources in times of need, and would have thrown open a range of unexploited niches for them. With need for active hunting reduced, selection pressures for maintaining the sting as an offensive weapon would have been diminished and that could explain why many of the most dominant ant species at present do not have a well developed sting. Coming back to how these ants have made up for the loss of the sting. Take the case of harvester ants from the genera Pheidole and Pheidologeton, in which there are multiple worker class (Fig. 4). Among these are the defensive soldier class which is large, has a disproportionately larger head and crushing mandibles. They tend to stay within a small radius of the nest and are extremely aggressive towards intruders. They may sometimes accompany other foragers to take down larger prey but other than these instances, they appear to do little for the colony. 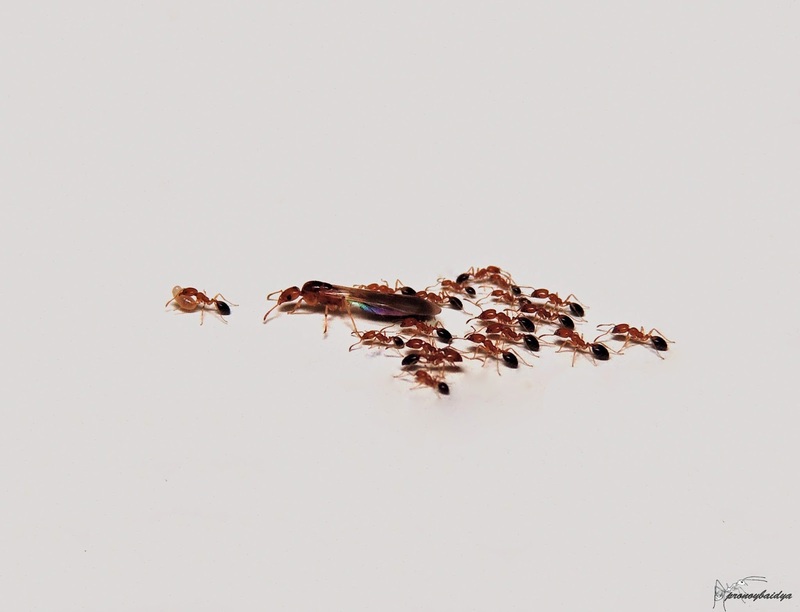 The Pagoda ants from the genus Crematogaster (Fig. 5), has a very unique chemical defense mechanism. The Crematogaster has a modified sting shaft at the end of which is a spoon shaped structure. This helps in holding a droplet of fluid (allomone) on the end of the sting. This fluid seems to have a repellent effect against other ants. If the droplet is applied onto an intruder, it immediately backs off and starts cleaning itself. Our very common house ant Monomorium pharaonis (Linnaeus, 1758) (Fig. 6) has independently evolved a similar chemical defense. The famous Asian weaver ant | Oecophylla smaragdina (Fabricius, 1775) (Fig. 7) is totally different from the above two. They consider attack as their best defense and make up for the lack of sting with a very unique mode of attack. They are equipped with razor sharp mandibles which are shaped like a scythe. Once latched on to a hapless victim, their vice like hold doesn't let go. They attack their victim repeatedly, and pour a cocktail of chemicals the dominant of which is formic acid into the wound that causes extreme irritation. They also have an ability to spray formic acid and many a times I have been a victim myself getting formic acid into my eyes while observing them closely. They also have a very unique way of killing their prey as I had mentioned in my first post. They will stretch their victim to the limit till either they are torn apart or succumb to this torture. What hence becomes clear from this is that not all ants have sting. Ants that sting will surely bite and ants that bite may or may not sting!!! Coming to the question of ant venom potency, ant venom like every other venom is protein. Extensive studies have been done on the characterization of venom in some ant genera like Solenopsis (Fig. 8) and Pachycondyla (Fig. 9). 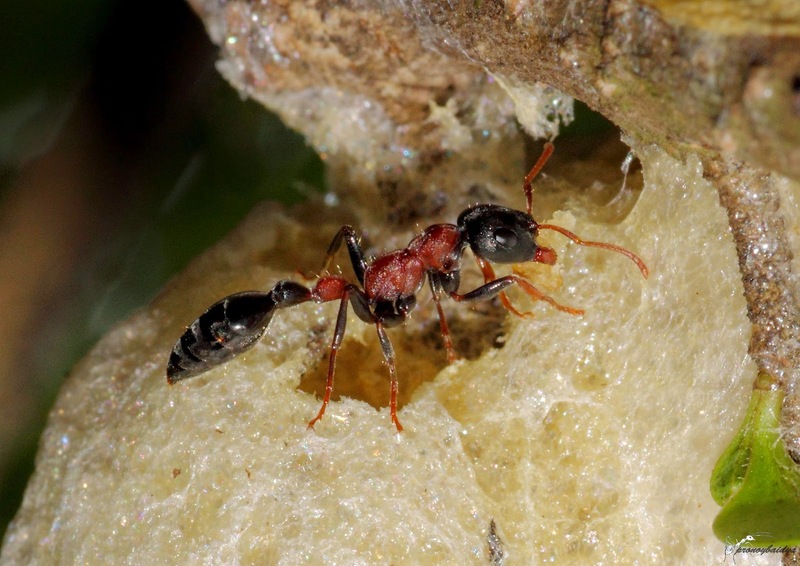 The venom of Red Imported Fire Ants | Solenopsis invicta (Buren, 1972) contains about 95% of water-insoluble piperidine alkaloids, which are responsible for the immediate swelling after being stung and many people dread the Red Imported Fire ant. These ants will appear nothing in front of the mother of all venomous ants in the world, the Jack Jumper ant | Myrmecia pilosula (F. Smith, 1858) from Australia. 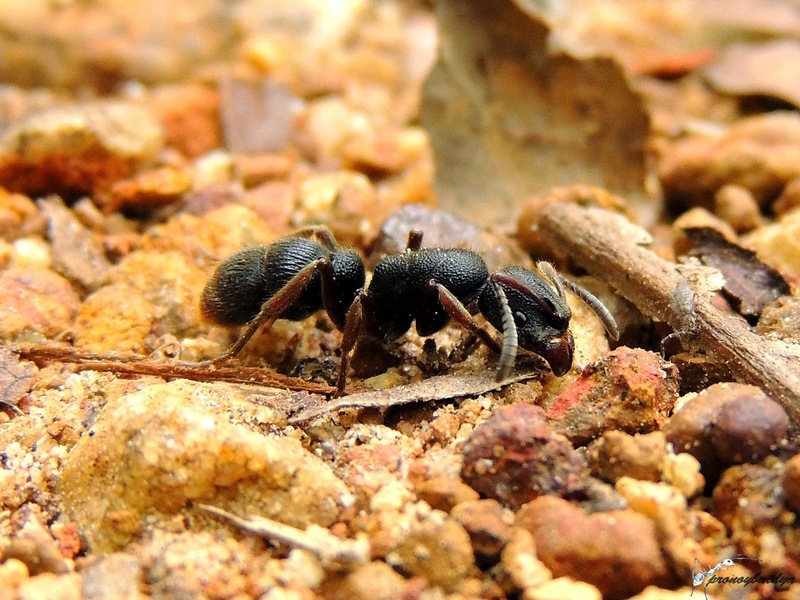 This particular species has been infamously called as one of the most dangerous ants of the world along with the Australian Bull ant | Myrmecia pyriformis (Smith, 1858). The venom of the Jack Jumper ant has a very potent mixture of histamines, haemolytic and eicosanoid elements. It is estimated that almost 3% of humans are highly allergic to the Jack Jumper's venom and mind you this ant is known to have killed six people in Australia in the past 20 years! So the next time someone says ants are harmless, remember to tell them about the Jack Jumpers of Australia. Well as usual what is the Indian and in particular Goan connect? In India out of the 10 subfamilies of ants, eight (Dorylinae, Amblyoponinae, Ectatomminae, Leptanillinae, Proceratiinae, Ponerinae, Pseudomyrmecinae and Myrmicinae) possess stings at varying levels of specializations and among them we have the highest chances of encountering members from Ponerinae, Pseudomyrmecinae and Myrmicinae, while members of Formicinae can make up for the absence of sting with other specializations like the Asian weaver ant. 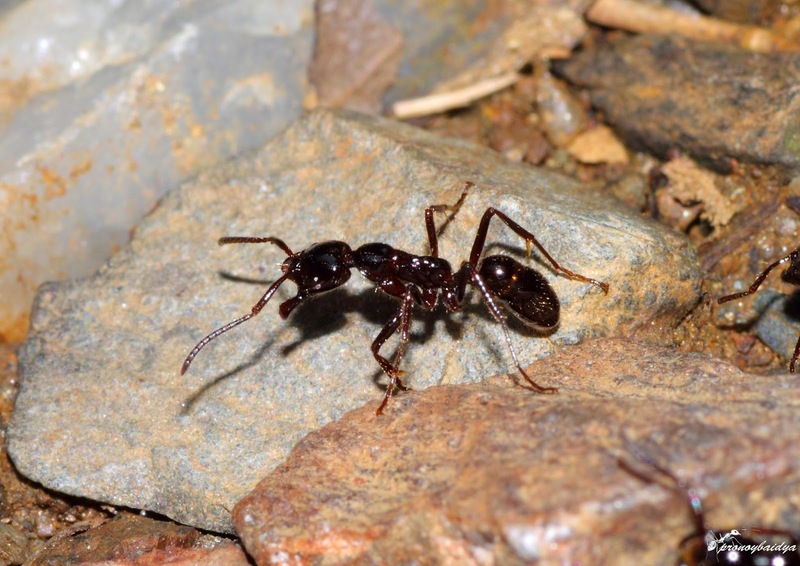 In Goa four subfamilies of stinging ants have been documented and more explorations may reveal the remaining subfamilies too. Perhaps the most notorious amongst all the ants that give a painful sting to most Goans is the arboreal bi-colored ant | Tetraponera rufonigra (Jerdon, 1851) (Fig. 10). The motive of this extra long post was not to scare you but to let you know that ants are extremely diverse and interesting than what is general perception. Even a small discussion on the sting of an ant can be written about for pages together. I will leave you with a video of how potent the Jumping Jack Ant of Australia can be. The biochemical composition of venom from the pavement ant (Tetramorium caespitum L.). An excellent article well presented with fascinating insights into the Ant world of bites and stings.